1. DON’T JUST START THROWING THINGS IN THE TRUNK. As with many projects, the key to packing your car is to start with a strong foundation. “Place your heavier or larger items with flat sides—like a camping cooler or camp stove, or heavier boxes when moving—and build up,” Summerset says. 3. … AND LEAVE SOME HOLES AS YOU BUILD. 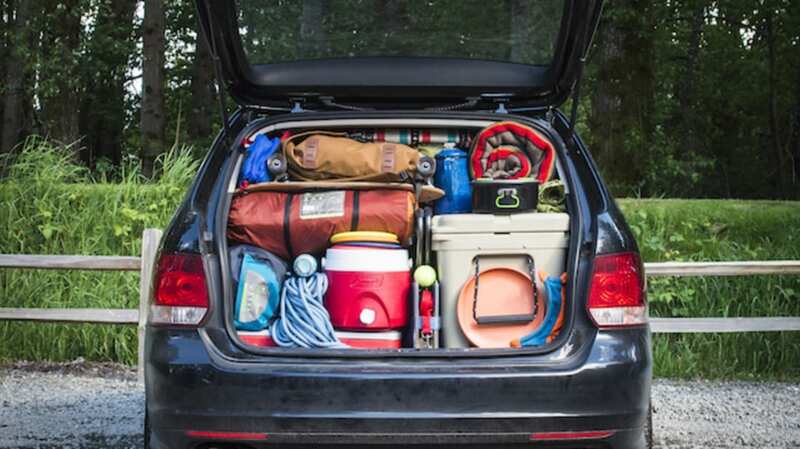 It sounds counterintuitive, but leave holes and gaps as you’re packing, which you can later fill with stuff you might need along the way—like camping chairs for a roadside picnic—which you’ll then be able to easily slide out. 4. POSITION BAGS JUST RIGHT. You want to make sure everything is easily accessible so you can get into everything without having to fully unload. Summersett advises doing things like turning bags so you can get to the zippers and putting lighting on the top just in case you arrive at the campsite at night. 5. UNROLL THOSE SLEEPING PADS. Not only will unrolling your sleeping pads give you more flexibility when you’re packing, but you can also put them to work: “They can be used to hold things together,” Summersett says. 6. STRATEGICALLY PLACE THE HEAVY STUFF. Any heavy or hard objects should be placed “below the highest point of your rear seat to prevent items from banging into your head given a sharp turn or sudden stop,” Summersett says. 7. THINK ABOUT WHERE YOU’RE GOING, WHEN YOU’LL ARRIVE, AND WHAT YOU’LL NEED WHEN YOU GET THERE. 8. WHEN YOU’RE DONE, SNAP A PHOTO. It will make it much easier to recreate what you’ve done for the trip home. Now hit the road!